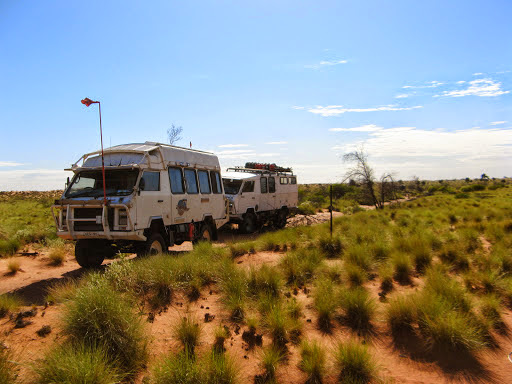 In July and August 2014, a group of 3 Okas and 6 people set out from the Great Northern Highway near Fitzroy Crossing in northern WA to cross the north western section of the Great Sandy Desert . With us (Janet and David, Oka 148) were Dave and Pauline (Oka 137) and Deano and Kaye (Oka 413). 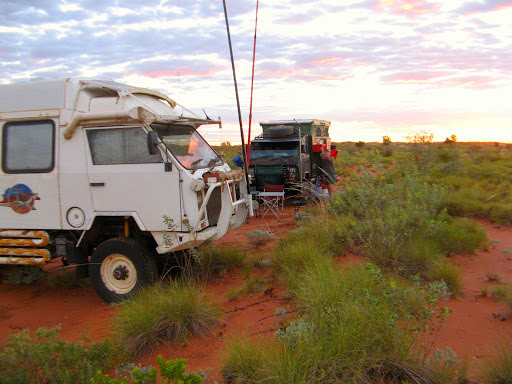 We each carried the maximum amount of fuel and water practical (around 300l of fuel and 250l of water per vehicle), food for several weeks, 6 spare wheels (all the same size rims for compatibility) plus a couple of spare tyre casings. 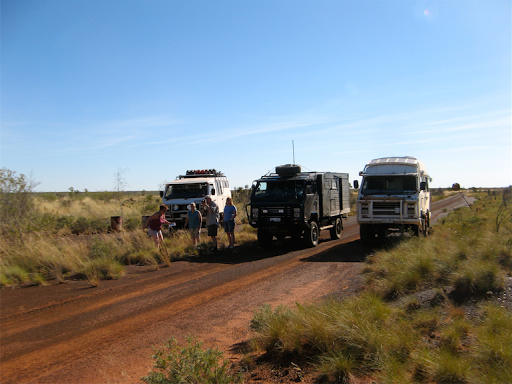 Between us we also carried 3 HF radios, 2 Sat phones, 3 GPS navigation systems, an EPIRB and an array of recovery gear. All 3 Okas were fitted with diff lockers front and rear to cope with the expected soft sandy conditions. 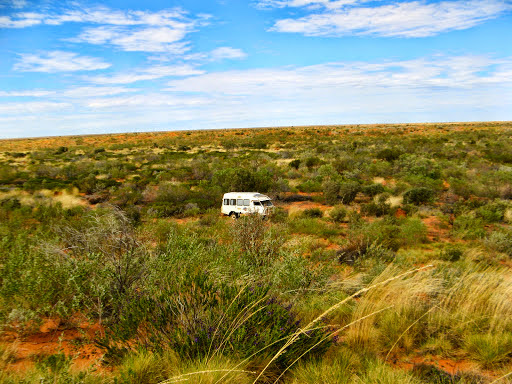 Our major safety concern was to avoid a vehicle roll-over at all costs, which is why we were so careful in reconnoitring routes over sand dunes. 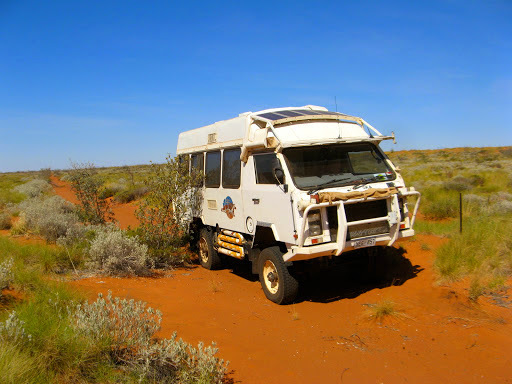 Between us we felt certain we had the spares, tools and expertise to fix or circumvent any major mechanical failure (we didn’t actually have any) but a roll-over would have have been a serious and possibly irrecoverable disaster. 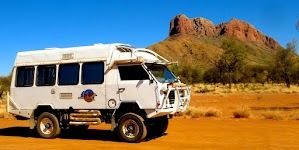 A things transpires, due to emerging fuel concerns, we had to abandon the side trip to Joanna Springs, which would have added around 250km to the route, and put that on the list for a future trip. 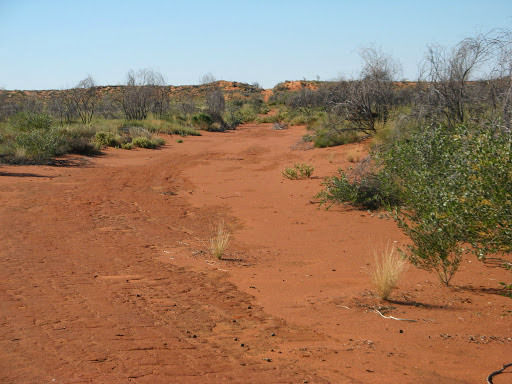 The blue and red tracks on the map above indicates our actual desert track, with the red centre section (about 400km) being the most challenging section. For most of that section there were almost no visible tracks to follow, only feint Google Earth photos of tracks (which were a few years old) that I had saved and geo-referenced for our mapping software before leaving home, and occasional exploration cut lines from the 1970’s and 80’s, most of which are very overgrown at ground level. 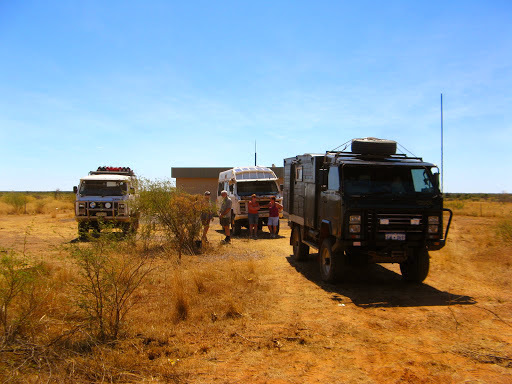 We had all arranged to meet at mid-day at a point 70km south east of Fitzroy Crossing on 29 July to start the crossing, but starting from 3 widely dispersed parts of the country, getting to the starting point was our first challenge. 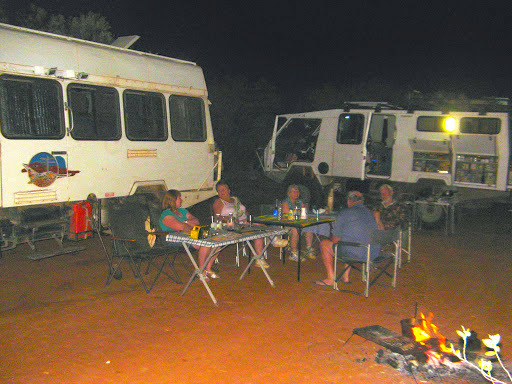 We came up from Adelaide, Dave and Pauline came up from Perth, and Deano and Kaye came across from touring in Queensland. 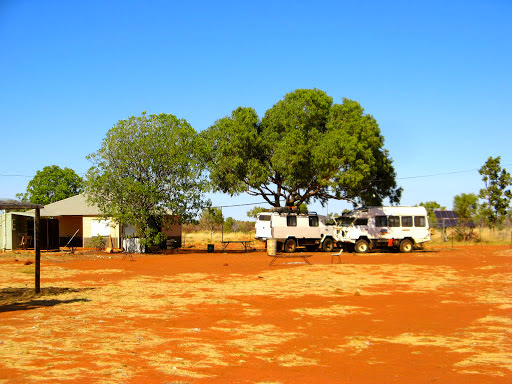 Coming up from Adelaide in less than a week, we completed the 1100km Tanami Track to Halls creek and met up with Deano and Kaye in the caravan park at Halls Creek. 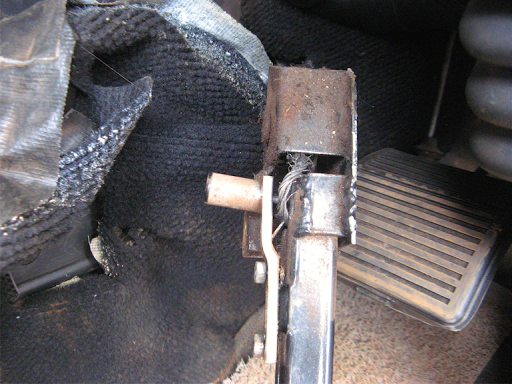 We compared notes on our Okas at some length and I did some maintenance work on the handbrake since the cable had slipped off its pulley and was jamming and got badly frayed. I tidied up the sharp hard frayed ends, wrapped them in tape, and to ensure the same thing didn’t happen again, I fitted a bespoke stop to the handle so that only fresh unfrayed cable went around the pulley and freed up some cable at the handbrake end to compensate. Apart from that we relaxed over a few drinks in the warm shade to discuss our future adventures. 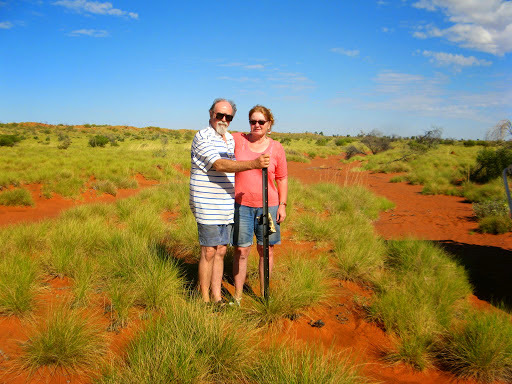 At 5pm we called Dave and Pauline at Jubilee Station where they were visiting friends, and confirmed when and where to meet them; midday on Tuesday at the Cherrabun turn off, 200 km west of Halls creek, before heading south west into the Great Sandy Desert. 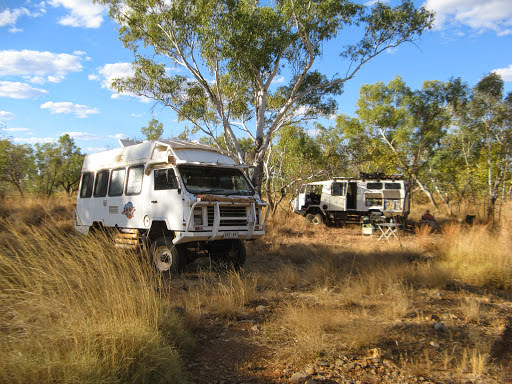 Tomorrow we’ll refill all the water and fuel tanks and do some final shopping for supplies in Halls Creek and set off west to a campsite on the Laura River. 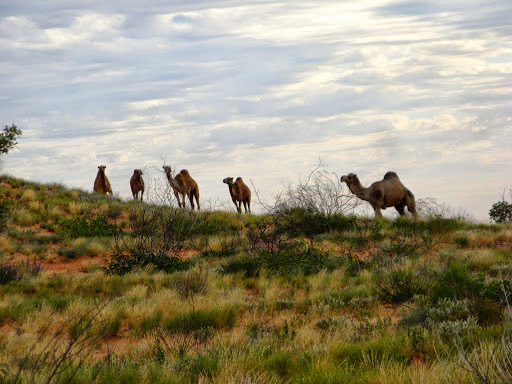 This will be the final upload of our blog for a couple of weeks, there are no Telstra phone towers between here and 80 Mile Beach on the other side of the desert. 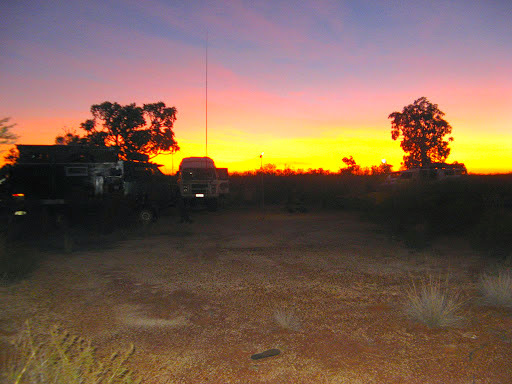 Refuelled, regassed and refooded in Halls Creek we set off 70km west to a Laura River campsite which Dave had recommended rather than the caravan congested Mary River rest area. A bit rough alongside the old river crossing but we did some gardening and made the most of it. 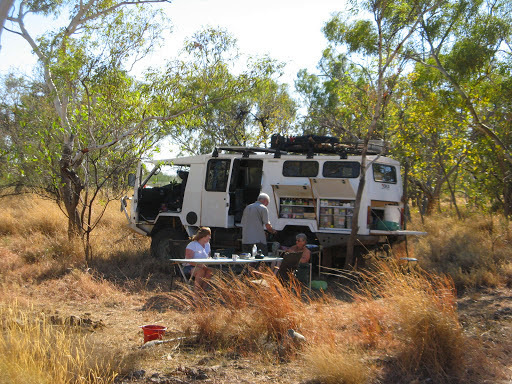 We met up with Dave and Pauline at the Cherrabun T/O, after a 140km drive from our previous Laura River campsite with Deano and Kaye, who we teamed up with in Halls Creek. They arrived one minute early and we arrived one minute late, not bad after 2500km from Adelaide. 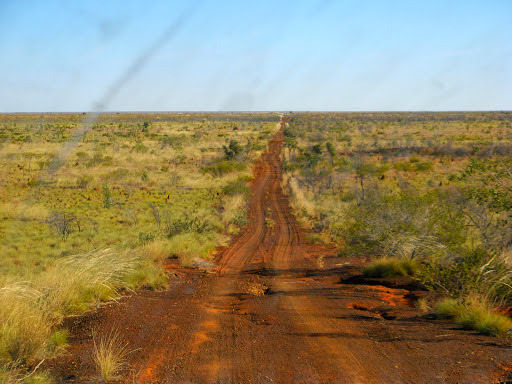 [Note for the future regarding fuel: In hindsight, we should have gone the next 70km to refuel again in Fitzroy Crossing. 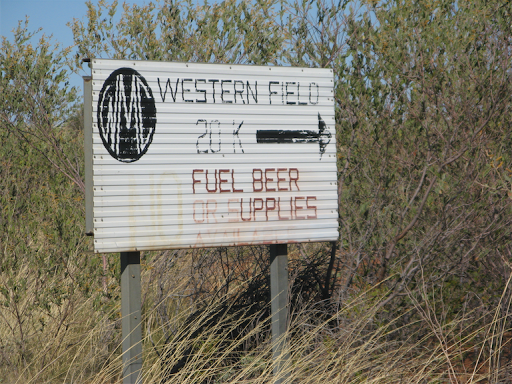 The 200km from Halls Creek had used valuable fuel which we were to need during the latter stages of the desert crossing, but we didn’t realise at the time quite how tough the crossing would be on fuel. 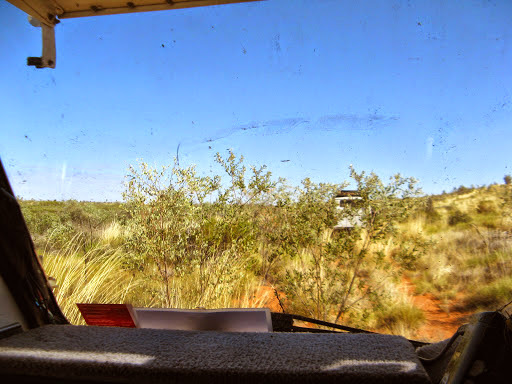 We drove quickly though picturesque Cherrabun station on rough station tracks, keen to get camped on an old abandoned WMC airstrip on the desert crossing proper. 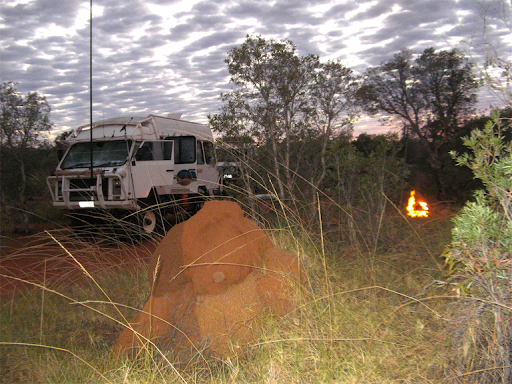 We located the old WMC airstrip about 100km in from the highway and set up for our first camp. We all had superb BBQ-ed Baramundi for dinner, courtesy of Dave and Pauline who had brought them from Jubillee Station where they’d been staying (and obviously fishing). 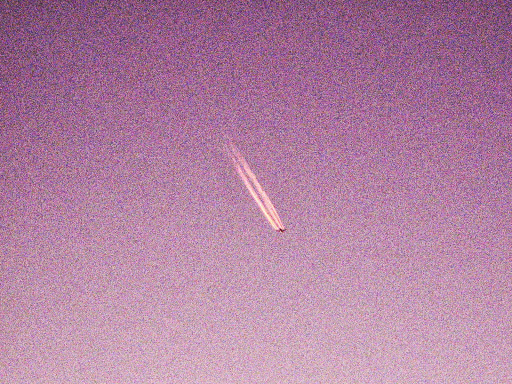 A high flyer passed over our airstrip campsite, which seemed appropriate. 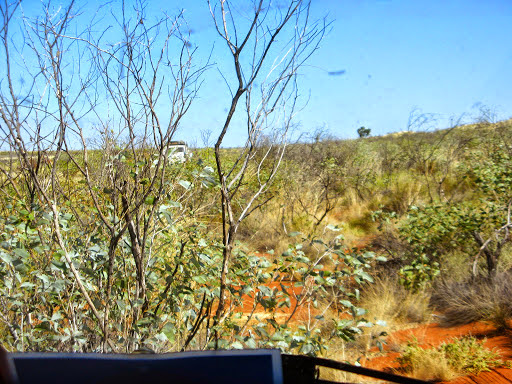 We drove though an abandoned Aboriginal out station and refilled with water at their still working water system, since we weren’t sure where our next water source would be. 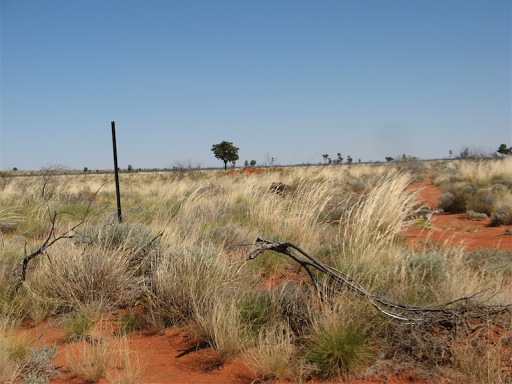 A few km further on we met the junction of the McLarty Track and turned west. 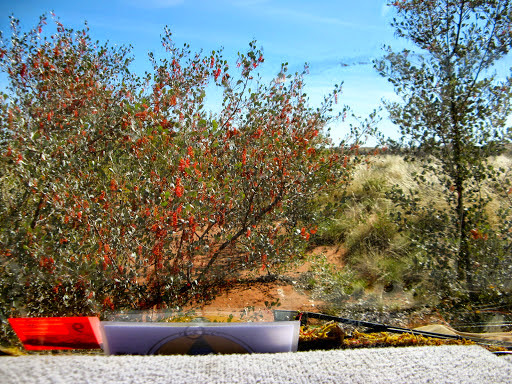 The track deteriorated in visibility and quality as we headed further west but the purple flowers and Holly Grevillea looks very pretty, when they weren’t blocking our way. 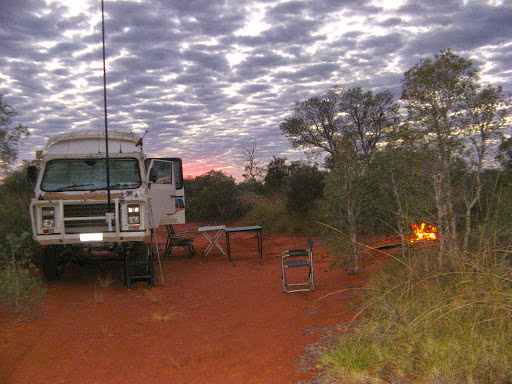 We camped 90km further on from last night, just off the track at an old mining campsite used by Dave a few years ago. We located their still working bore and drew water using Dave’s very effective flap pump. We didn’t know it then but this would be the last useable water we located until Sandfire Roadhouse a week and a half later. 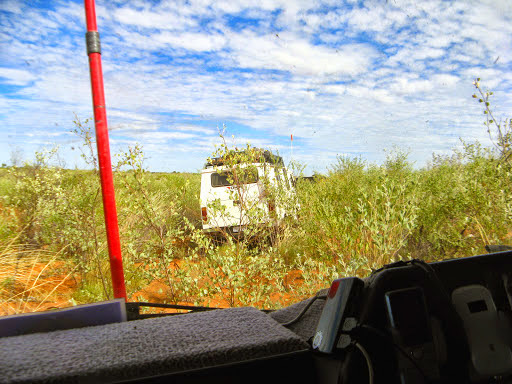 From here the track started to deteriorate further and became overgrown requiring frequent deviations around thickets of small trees and bushes where we couldn’t push through them. We only achieved 47km today. 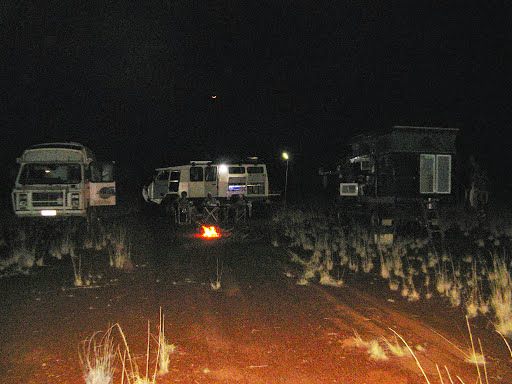 The camping arrangements were becoming more organised each night. 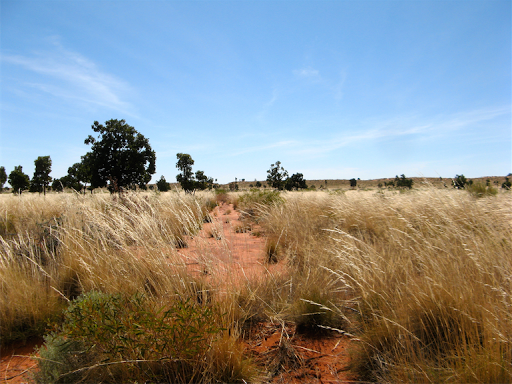 Another slow day along the McLarty Track, we only achieved 44km today. 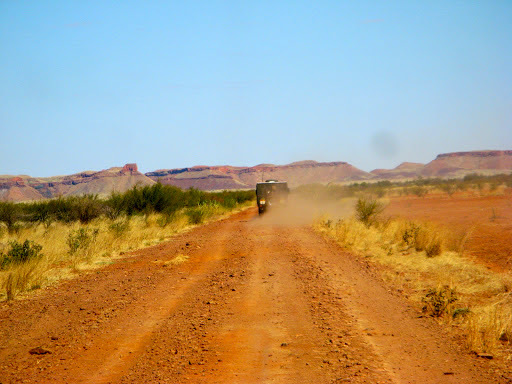 We were on even more our own for this section, but we knew where we were and we knew what we were heading for. 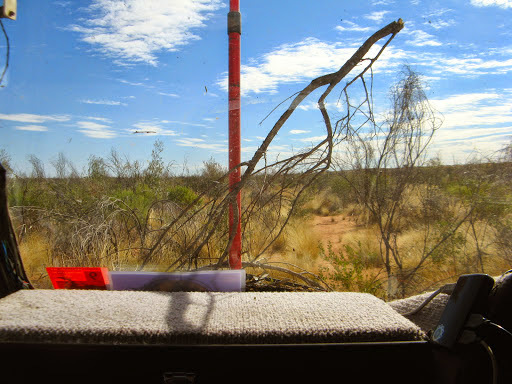 Fortunately there were still some signs of a track on the ground and occasional signs of human presence to provide reassurance we were on the right line. 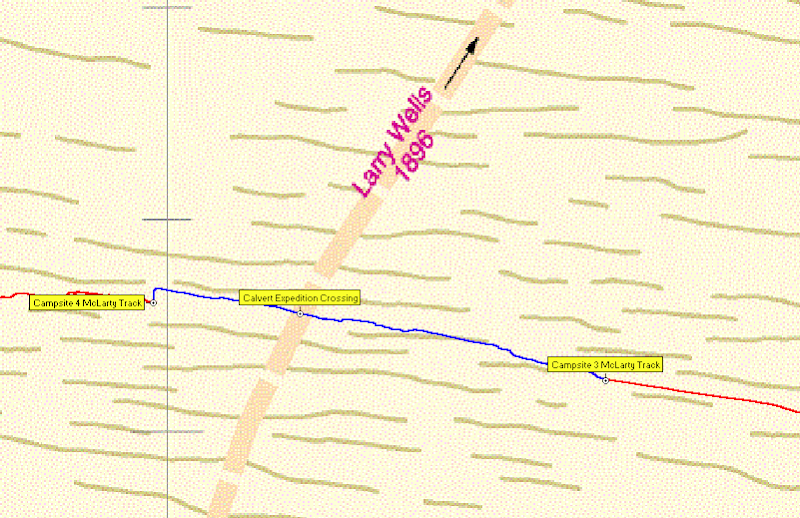 We passed the approximate location where the 1896 Calvert Expedition crossed our track. 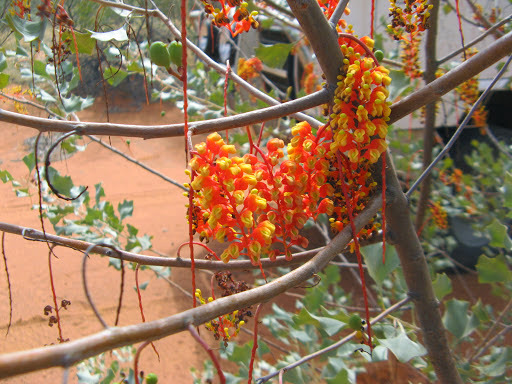 [Calvert financed the expedition but it was led by Larry Wells, you can read the book of their explorations online here]. 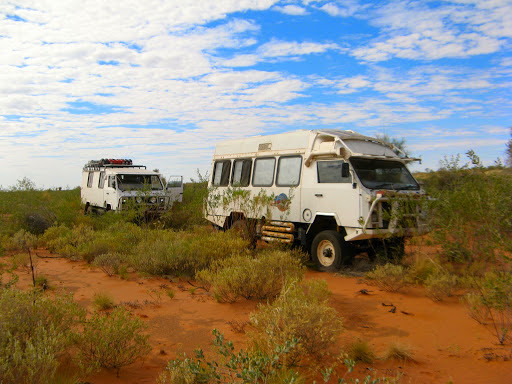 They were heading north and having to cross thousands of sand dunes in the process, whereas our track was predominantly east/west to minimise dune crossings but we still crossed more than 100. 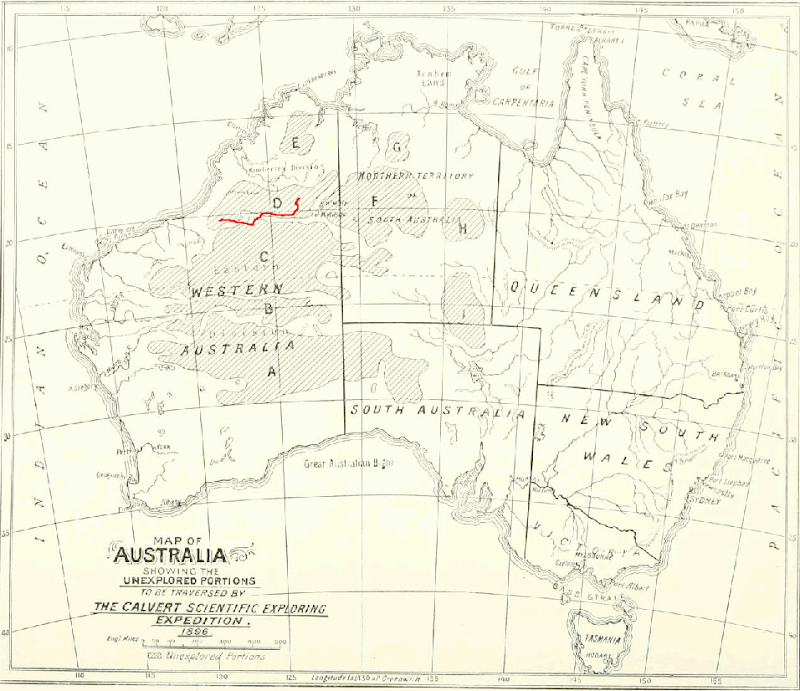 Our 700km desert track, in red, superimposed on Calvert’s 1896 map of unexplored areas of north western Australia. 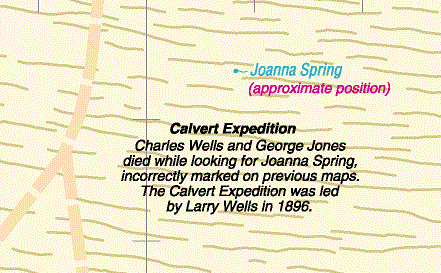 Two of Calvert/Wells’s men (Charles Wells, cousin of Larry, and George Jones) died in the desert of heat and thirst in November 1896, “a day’s march” from Joanna Springs, but it took 6 months of exhausting searches to find them. 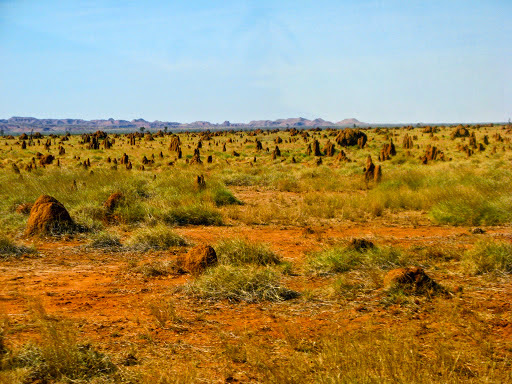 Their mummified bodies were eventually recovered and buried in Adelaide. This was the day we had to seriously start making our own tracks. The dotted red line on the maps disappeared completely yesterday and today the tracks on the ground did likewise. 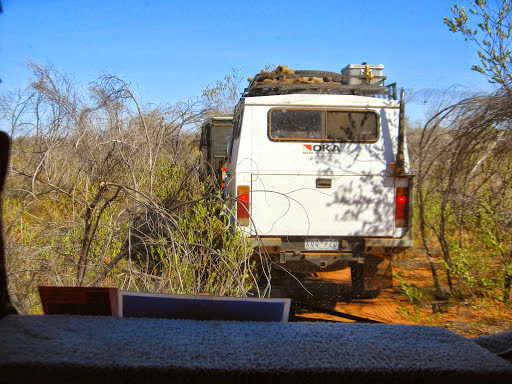 We were left with Google Earth photos and the track plot of a previous adventurer to guide us. As a result we could only achieve 22km today. 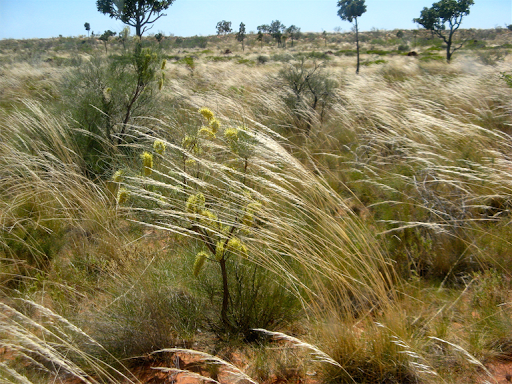 Here’s a video of pushing our way across the desert spinifex. 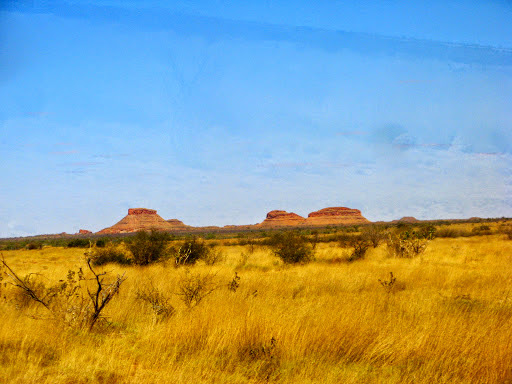 It started fairly easy but was to become more difficult, much more difficult in the later stages of our trek. 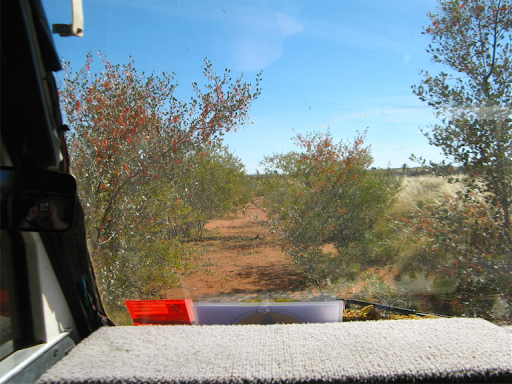 After about 20km this morning we regained the red line on the map and reached the McLarty No 1 drill site, but we couldn’t locate their bore, so we had lunch here instead. 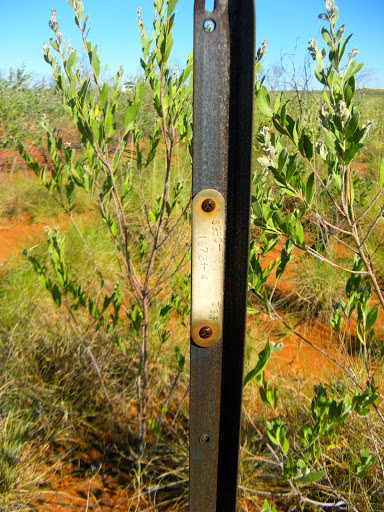 The McLarty No 1 drill site was made in 1968, with the details firmly etched into a piece of thick steel plate. 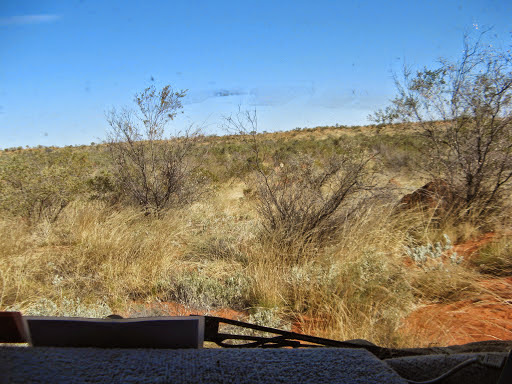 We located the junction of the Edgar Ranges Track from the north which showed some evidence of recent wheel tracks (a day or 2 old) although we never saw anyone, and turned south down the McLarty Hills track which was an old mining cut line but now mostly very indistinct and overgrown. 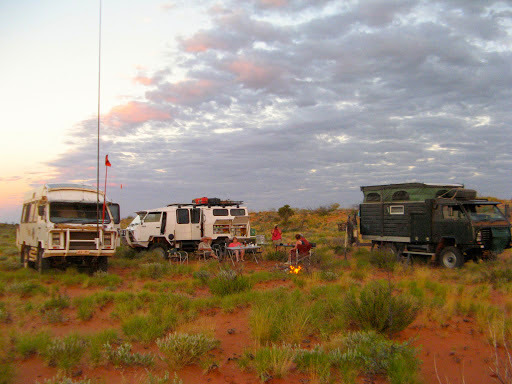 We managed a bit further today, 32km, but it was hard slog and we were getting tired so we made camp a few km short of the McLarty Hills, they could wait until tomorrow. 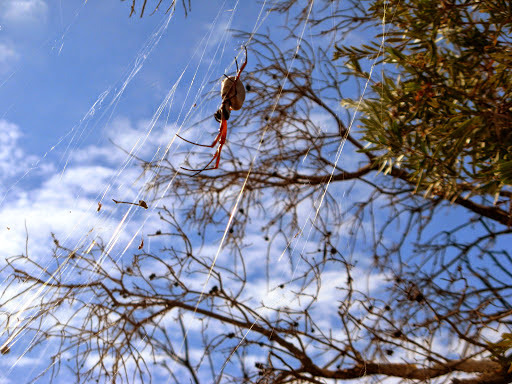 As I explored the facilities around the campsite I noted that it’s so dry out here your wee dries up before it hits the ground (almost, men only). 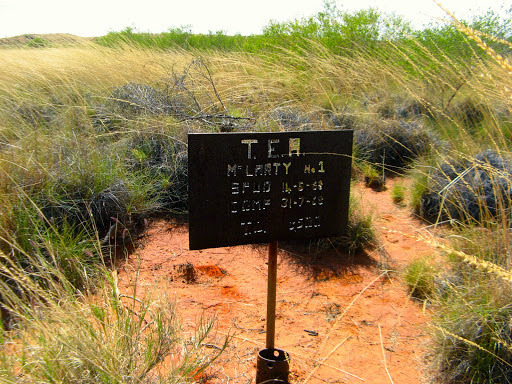 Tomorrow we should reach the McLarty Hills, our first major objective. 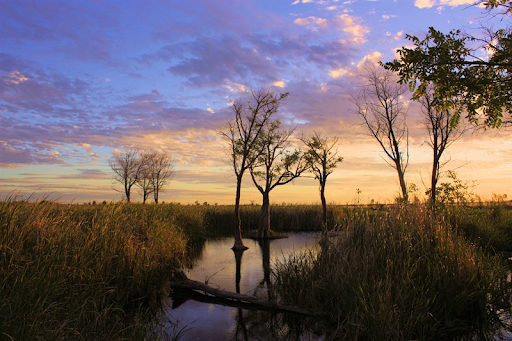 See “Exploring the McLarty Hills”.